Home > Blog > VACMA: Fife – Next Deadline Early February 2019! VACMA: Fife – Next Deadline Early February 2019! The end of 2018 is fast approaching, but just around the corner in early 2019 is the last deadline for this financial year’s VACMA: Fife awards! Devolved grants, co-funded by Creative Scotland and Fife Council and administered by Fife Contemporary (and later Fife Cultural Trust), began in Fife in 2007 when craft makers were funded. Soon after this the scheme was extended to visual artists too, and the whole scheme nationally is now spread across many of Scotland’s local authorities. These awards aim to support the ambition and creative development of craft/visual artists. For certain deadlines (including the upcoming one on 5 Feb 2019), a Programme Development award is available. This supports artists who are at a stage in their career where they have identified the opportunity for significant development of their artistic practice to take it to a different level. It should not be seen as just a larger version of a Project Grant – there is a significant difference between the two. If you have a project that you think might fit the VACMA guidelines, OR if you feel that you are at an appropriate stage in your artistic career to apply for a Development Programme award, please read both the guidelines’ document and the relevant application form. The guidelines give a national context for them as well as describing VACMA: Fife; they also explain the application process itself. After that, we’d also encourage you to contact us for a quick chat to doublecheck what you plan to apply for – it’s an easy way to have questions answered and saves you wasting your time later. Fife Contemporary has a full page devoted to VACMA: Fife on our website. In addition to the downloadable guidelines and forms, you can also browse a selection of short films featuring past successful applicants to the process and find out why they found the scheme beneficial. 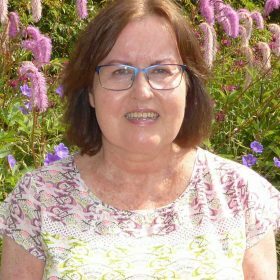 It is difficult in the current political climate for local authorities to find sufficient funds for these awards and in Fife we have fought hard to keep them running. We cannot tell from one year to the next if they will be available in the following financial year. 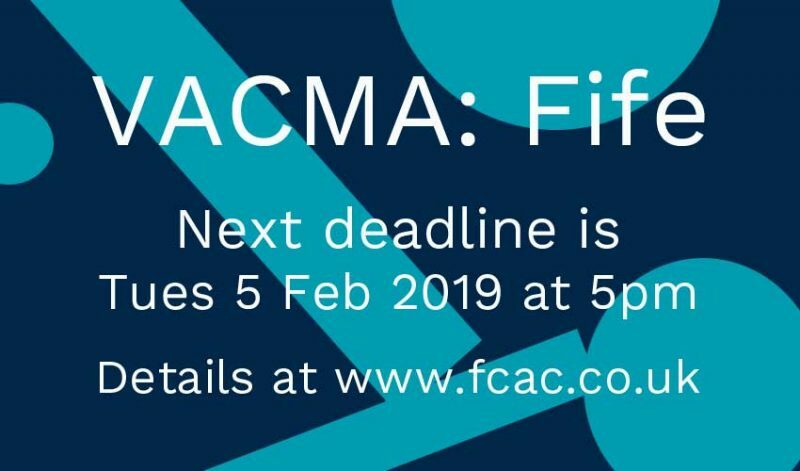 So our advice to any artist reading this would be – if you think that VACMA: Fife might be for you, do not delay in applying as we cannot guarantee that there will be further deadlines after the one on 5 February 2019. Put Christmas thoughts aside for a few moments and just consider whether you too might make the cut this February! Administers programme, artists’ newsflashes / mailing list, website, design, press/social media.